Build a hardscape in Phoenix, AZ, you can be proud of with the landscaping and hardscaping experts from Earthtones Landscape Management! We can design and build walkways, sidewalks, pool areas, fountains, patios and lounge space, barbeque pits, fire pits and so much more! Hardscaping differs from traditional softscaping (landscaping) because of the materials used to create it. Traditional landscaping modifies an area by sculpting and crafting the land in such a way as it becomes desirable in appearance. Hardscaping happens much in the same way, but after carving out the land, “hard” materials, like wood, stone and cement are used to finish the product. If you are interested in hardscape in Phoenix, Scottsdale, Glendale or anywhere in the Valley, Earthtones Landscape Management is here to offer our first-rate services and talented design team to make your ideas come to life. Our hardscaping professionals can design, build and pave sidewalks, pathways, pool areas, patio spaces and so much more. If you’re interested in a new fire pit or barbeque pit, we can do that, too! Where our professional landscaping services end, our hardscape and paving services begin, perfecting the job and leaving you with nothing but a beautiful, serene and welcoming property your family and friends will love to enjoy year-round. 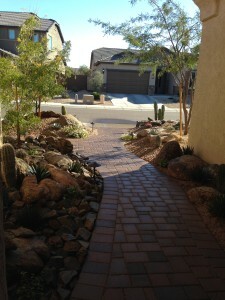 Before you take a look at other Phoenix hardscape services and hardscape pavers, give us a call. Our quality work and affordable prices set us apart from other Phoenix hardscape companies, so don’t make a decision until you speak with our designers and receive a no-hassle, no-obligation quote. Contact us now to begin transforming your lawn into something you can be proud of with hardscape services and paving services from Earthtones Landscape Management!